This tutorial demonstrates how to add Stored Procedures	while integrating with Database in Decisions	. 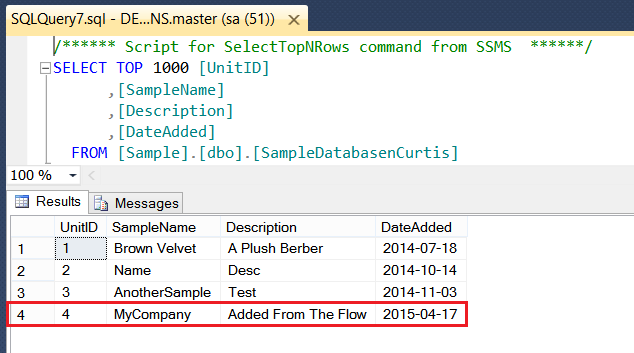 Next, we will call Stored Procedure	from the Flow to write data to the Database we integrated with. 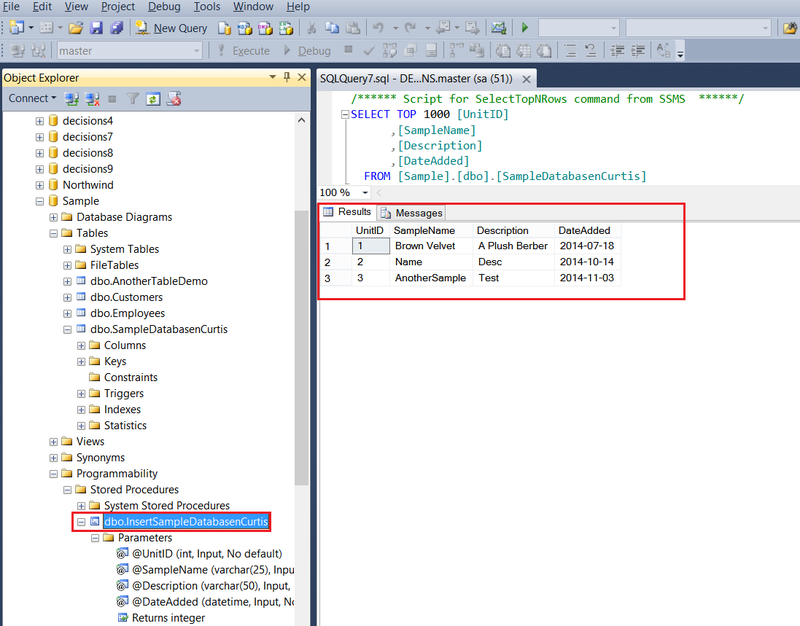 For our example we have a simple Database with a Stored Procedure	that inserts a new row into the Database . To integrate with this Database in Decisions Portal	we navigate to the System > Integrations > Databases	and click Integrate With Database button on the Folder Actions Panel . In the resulting pop-up window we input connection details and click Next	. We can skip next Add Views window by clicking Next	. In the Procedures	window we select our Stored Procedure	and click Save	. Our database integration is added to the Decisions . Next, we navigate to the Designer Folder	and click Create Flow	button from Folder Actions Panel. 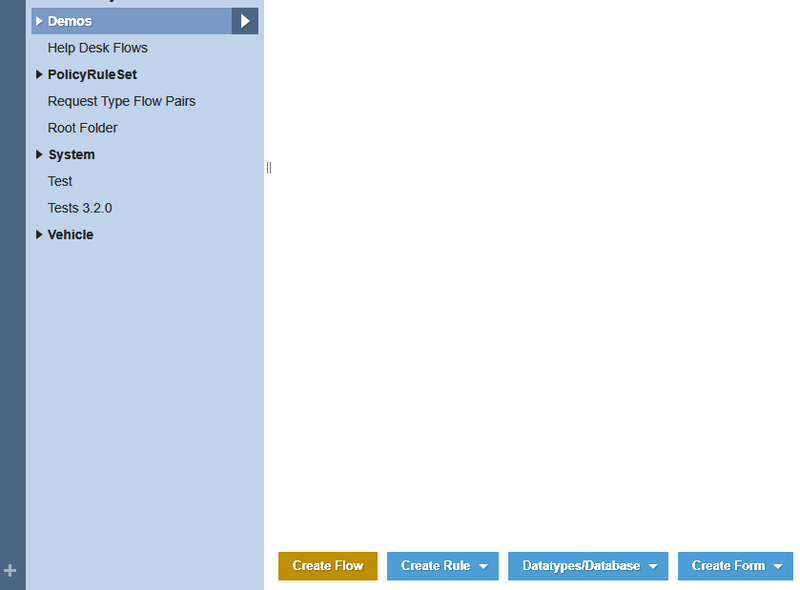 In the resulting window we provide our Flow with the Name	and click Create	to proceed to the Flow Designer. 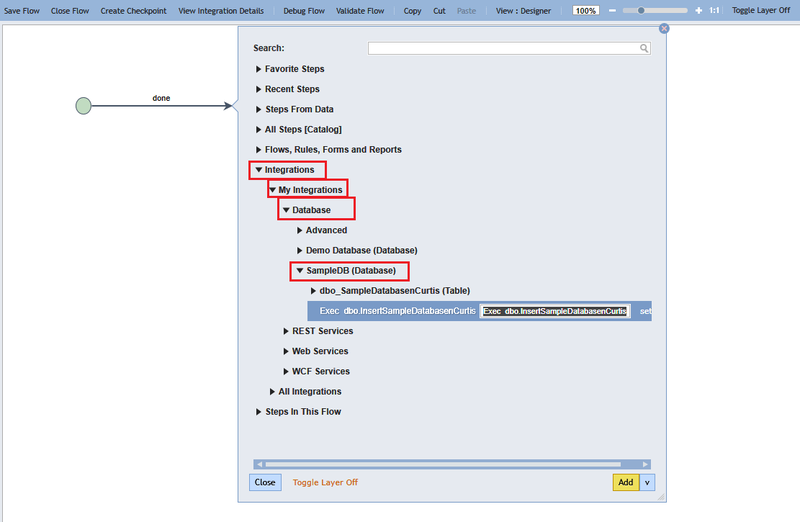 In the Flow Designer we can locate a step that was generated for execution of the Stored Procedure under Integrations > My Integrations > Database > [Name] (Database)	category. We add Exec dbo.InsertSampleDatabaseCurtis	step to our Flow . 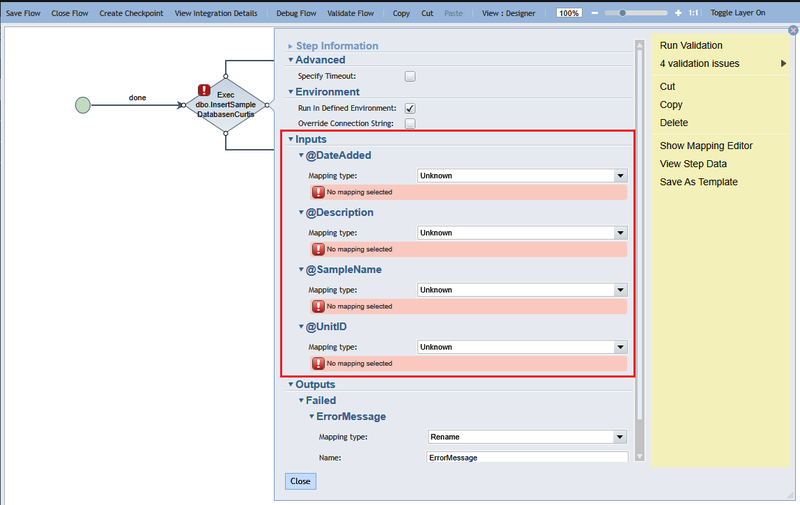 For the simplicity of this example we just connect both outcomes from Exec dbo.InsertSampleDatabaseCurtis	step to the End	step in our Flow . Next, we select Exec dbo.InsertSampleDatabaseCurtis	step on the workspace and Step Information Layer	pops-up. 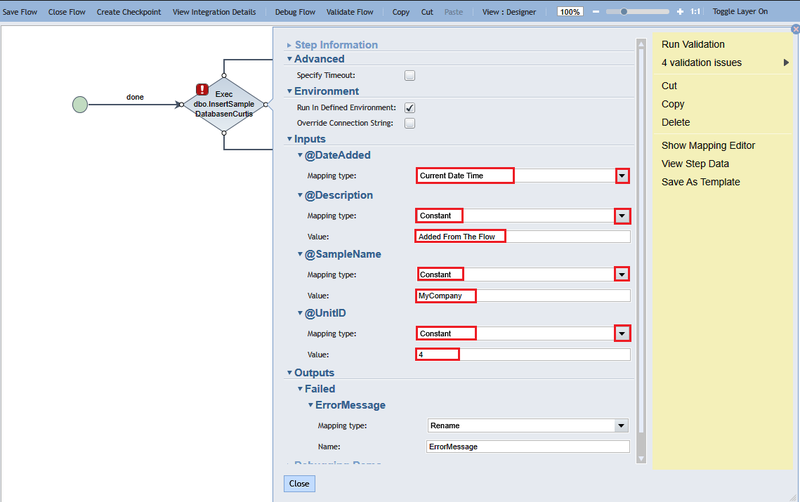 In this layer we can configure data that we would like to write to the database. 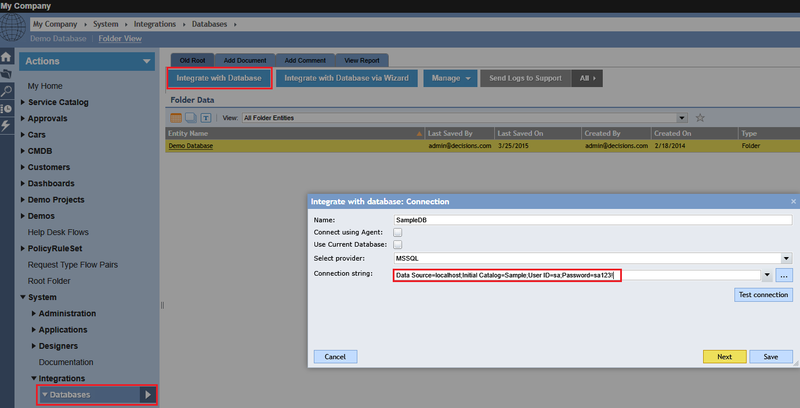 In this Example we simply use Constant	data that will be inserted into the database. 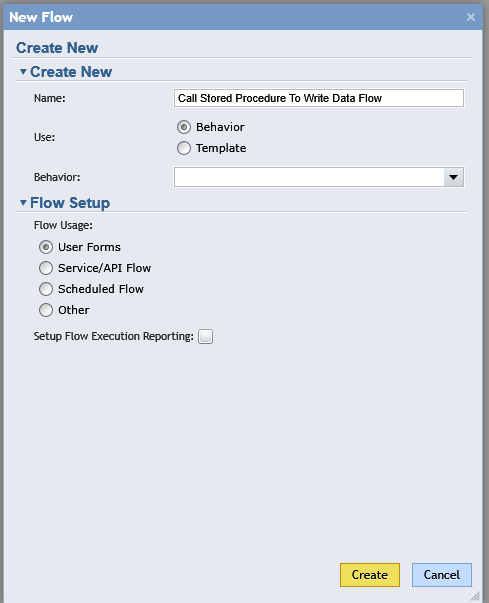 Next, we close Step Information Layer and click Debug Flow	link from the top panel in the Flow Designer to test our Flow . Note that in Decisions version 3.5 and above, you&apos;ll need to click Test Flow	to access this function. Debugger indicates that our Flow was executed successfully with no errors. If we check our Database we can confirm that our new row was added from the Flow .